RailPAC invited Amtrak CEO Richard Anderson to present his vision for Amtrak in the 21st Century at the Annual Steel Wheels Conference in Sacramento, Saturday 29th September. A brief (terse?) response from his PA informed us that he is “unavailable”. No offer, as in the past, to send a senior officer in his stead. It has been clear from his dealings with politicians and other advocates that he has no time for opposing opinions, nor for those of us who are the true, loyal supporters of passenger rail. So the fight for the National Network continues. Be sure to support the Steel Wheels Conference and Annual meeting. There will be plenty of interesting and informative speakers, and discussion as to how we continue the fight for the National Network. Unfortunately due to a conflict, we must postpone this event. We hope to reschedule at a later date. 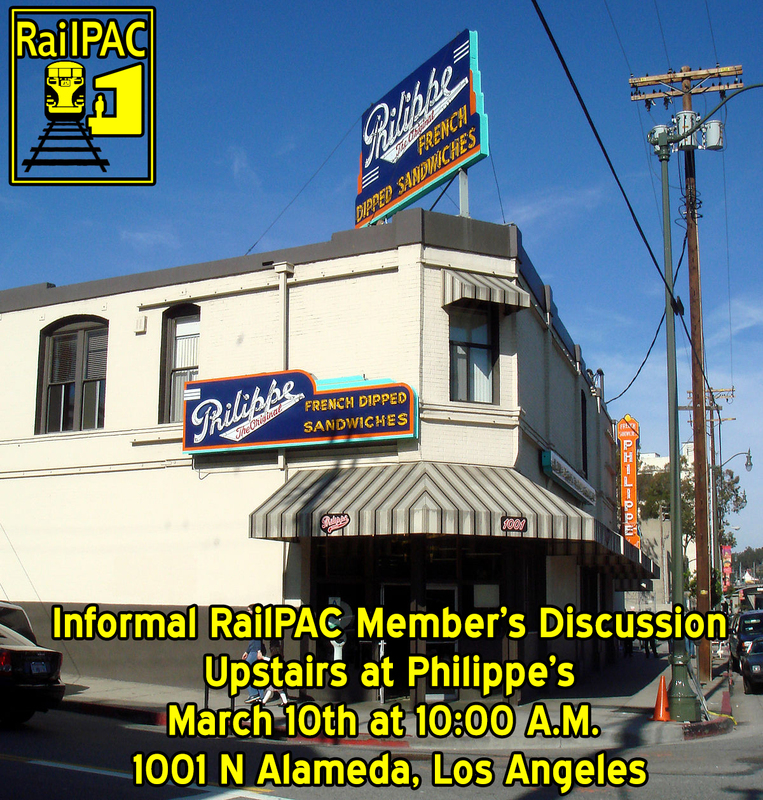 There will be an informal members discussion March 10th at 10 AM within walking distance of LA Union Station and the Chinatown Gold line station at Philippes the Original, 1001 N Alameda, Los Angeles. RailPAC members welcome! Meetings usually occupy the first room (to your left at the top of the stairs) on the second floor of Philippes. Tuesday, October 26 at 6.00 pm there will be a joint meeting of Burbank City Council and the City Transportation Commission. High Speed Rail is the first topic and the meeting is sure to attract opponents from neighboring communities. RailPAC members are encouraged to attend to show support for the project. As Chair of the Transportation Commission I’ll be making a presentation. I’ll also be staying for public comment to counter some opposition arguments. City Hall is walking distance from the downtown Metrolink station and on many Metro bus routes. Please try and attend. SUPPORT OUR LONG DISTANCE TRAINS! STEEL WHEELS 2015 Conference is your opportunity to show your support for the long distance trains. By attending this gathering you will show our Los Angeles based Amtrak Board member, Yvonne Burke, that we are behind her as she represents the western states at Amtrak Board meetings. In addition Ms. Burke is a member of the California Transportation Commission. In addition to Ms Burke we’ll be joined by newly appointed Amtrak route managers Jay Fountain and Eric Smith, who will describe their initiatives to improve revenue and amenities. Jay is responsible for the Sunset Limited, Texas Eagle and Heartland Flyer, while Eric manages the Coast Starlight and the Southwest Chief. Register today and let’s show these folks, and Amtrak in DC, that we believe in the long distance trains and will support them. 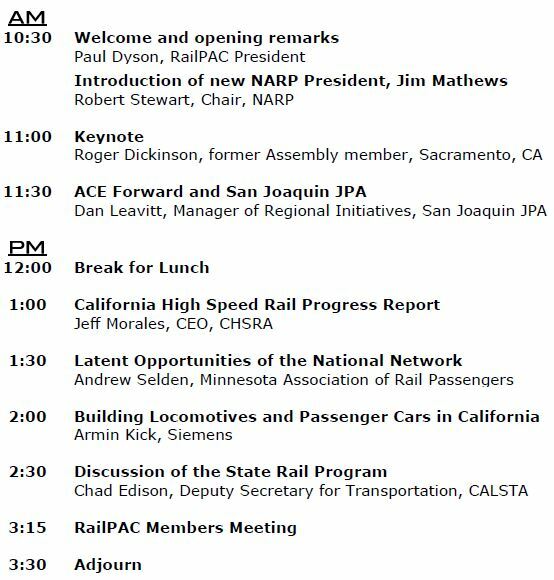 Once again RailPAC and NARP are presenting the annual Joint RailPAC/NARP Conference, a must for rail advocates. Conveniently located at the Los Angeles Metro Board Room at Union Station in Los Angeles, California this meeting will kick off with information and discussion about the issues facing passenger rail. Keynote speaker will be Director of the Amtrak Board, Yvonne Burke. 2016 will be a challenging year for Amtrak, regional and High Speed Rail. Industry leaders will present their thoughts on growing a mobility network for California. In the afternoon we’ll address the role of advocacy groups and how we mobility advocacy groups are invited to participate. Rail Propulsion System – Hybrid diesels and after market emission systems. Although Amtrak will not be sponsoring National Train Day this year RailPAC, together with a number of local groups, is continuing the tradition at Santa Barbara. Train Day will take place Saturday May 9th at the historic depot. County Supervisor Salud Carbajal will emcee the event and State Senator Jackson and Mayor Helene Schneider are confirmed attendees. The day will start for those wanting a train ride with train 774 to Carpinteria, returning on 1761. Events and ceremonies will begin upon arrival of 1761 at about 10.30 am.